Avianca: single commercial brand for the airlines in Avianca holdings s.a. The “new Avianca”, which includes the operation of Avianca, TACA Airlines, Aerogal, and Tampa Cargo, aims to provide a world class service with excellence and warmth. After aligning the travel experience, the company sets forth to strengthen its market position through superior service distinguished by a new visual system that will be gradually applied to airplanes, airports, uniforms, printed and online publications, amongst other distinctive company elements. This new image integrates cultures from Avianca, TACA Airlines, Aerogal, and Tampa Cargo, seeking to project a new phase of growth and consolidation of the airline in Latin America and the world. As announced in late 2012 and after three years of intense work aimed at integration and reorganization of operations and processes, ground and air equipment modernization, and the adoption of industry best practices, the airlines in Avianca Holdings S.A. (formerly known as AviancaTaca Holding S.A.) begin a new stage in their business development under the commercial brand Avianca, with its new visual standards. Honoring the business development reached by Avianca and TACA Airlines with 94 and 82 years of uninterrupted operations, respectively, the new identity bonds the heritage of the route network, envisioning connecting the continent through all cardinal points, capturing in the logo the service provided through the skies of the Americas. The image of the “new Avianca” will be displayed in over 160 airplanes, 14 thousand seats onboard, 214 ticket offices, 100 airports, VIP lounges in 25 countries, as well as the corporate buildings in the Americas and Europe. This new image will also dress over 13.000 employees with client service positions -out of the 18,000 total-, and identify our new integrated website, social networks, onboard reading materials, and corporate communications media in general. This new image highlights a very important chapter in the airline´s history, striving to provide a strong product and service offer in order to become the ideal partner for business and leisure travelers. “More than 5.100 weekly flights operated on a modern fleet enable us to help our travelers reach 100 destinations in 25 countries throughout the Americas and Europe, provide access to 21.900 daily flights served around the world by Star Alliance member airlines, be preferred by more than 23 million passengers who choose our services yearly for their travel plans and the transportation of 300 thousand tons of goods. This motivates us to assure the “new Avianca”, as the leading airline in Latin America preferred by the world´s travelers,” quoted the executive. Fleet. The combined fleet size between Avianca and TACA Airlines at the moment of their integration was 129 aircraft. Currently the company has 151 aircraft in operation. Within its fleet modernization plan, Avianca recently announced the incorporation of Airbus A320neo airplanes equipped with new generation engines, as well as aircraft fitted with sharklets, which provide a 4% better fuel economy than previous models. 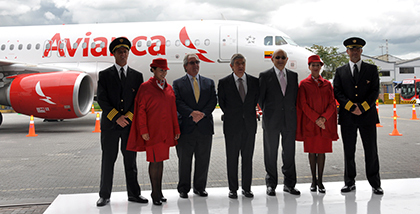 Avianca welcomed the first aircraft of this type to its fleet in February. Tampa Cargo acquired four new A330-200 freighters with cargo capacity of 68 tons in order to strengthen the cargo business. The first aircraft of its type joined the fleet in December of last year. The company also announced the standing offer to purchase 15 ATR72-600 aircraft, along with the option to purchase an additional 15 of the same model. This turboprop fleet is intended to serve routes within Colombia and Central America and will join the fleet beginning July this year. Finally, the company has confirmed the purchase order for 15 Boeing 767 Dreamliner aircraft, to operate transatlantic routes starting in 2014. Route Network. Currently, the “new Avianca” covers 100 destinations in 25 countries in the Americas and Europe, through 5,100 weekly flights. The domestic and international connections operate from and to Bogota (Colombia), with more than 2,656 weekly flights, San Salvador (El Salvador), with 532 weekly flights, and Lima (Peru) with 483 frequencies per week. Also connections to and from other Latin American capitals are part of this comprehensive route network. In addition to its own network, travelers connecting through Avianca are able to reach more than 1,320 cities around the world thanks to code-share and interline agreements with world renowned airlines, granting access to 990 VIP lounges and enjoying multiple benefits provided by the Star Alliance network around the world. Transported Passengers. As a result of the synergies of the route network, the airlines in Avianca Holdings S.A. have experimented passenger growth. A comparison between 2010 and 2012 reflects an increase of 31.88%. In 2010, the airlines transported 17´510.881 passengers, reaching 20´454.924 in 2011, while in 2012 the number increased to 23´092.533 passengers. Joining Star Alliance. Avianca and TACA Airlines officially joined Star Alliance on June 21st 2012, which is the largest global airline network in terms of daily flights, coverage, and services. As a result travel advantages and options for our travelers multiplied. In order to be accepted as member airline of the alliance, multiple requirements had to be fulfilled along with several service and operational standards. The “new Avianca” maintains these standards and complies with the periodical audits required. Avianca Cargo. In 2010 the Cargo businesses of Avianca, TACA, and Aerogal were integrated to Tampa Cargo, building on more than 100 years of experience in the field. After centralizing management, operations, and service the cargo offer underwent a strengthening process. As part of this process the airline announced the acquisition of 4 A330-200 freighters with 68 ton capacity and became the first airline to operate this model in Latin America. With the expansion of capacity through dedicated aircraft, as well as the bellies of the passenger fleet, the route network was also broadened to meet importer and exporter needs in Latin America, accompanied by the implementation of new integrated technologies for all the business. Today, under the name “Avianca Cargo” this business unit focuses on delivering increased connectivity and services through advanced technology and a highly specialized human team. Technology. Avianca continues moving forward in the implementation of the latest technology in order to better serve its passengers. In addition to online tools for checking fares, booking reservations, purchasing tickets and seat selections, the airline has been implementing self-check-in modules in 36 of the airports where it currently operates. Travelers can also make use of the web check-in feature for routes in the Americas, allowing them to check-in from the comfort of their home or office. Passengers may also check-in using their smartphones. This service is initially available for domestic flights in Colombia and Peru, and direct international flights, except Europe, from El Salvador and Medellin and from Bogota to South America, improving check point and boarding times by showing the boarding pass on their smartphones. VIP Lounges. This past February, Avianca opened its new 2,000 square meter VIP Lounge located in the international terminal of Eldorado Airport in Bogota, aimed at the members of its frequent flyer program, LifeMiles, and business class travelers. In meeting its service improvement plan, the airline will also refresh the VIP lounges in Cali, Barranquilla, Medellin, Cartagena, and San Salvador. LifeMiles. It was the first joint business deliverable. The unified loyalty program was the result of integrating best practices of both Avianca and TACA, and improving them based on studies on the leading loyalty programs from top airlines around the world. LifeMiles has more than five million members and was recognized by travelers with a Freddie Award in the category of Best Redemption Ability, making it the only loyalty program in Latin America to receive a Freddy Award during the 2013 edition.